Who doesn’t love meandering through organic markets on a Sunday? Even if one is hungover, the mood would improve with the smells and tastes of the different food offerings. For the record, we weren’t hungover, in fact we were feeling rather sprightly and pious for being up so early on a weekend day. Just as we usually dine at the official Nana o’clock time (around 5.30pm), so it seems that we do Nana o’clock breakys these days. We officially hang out with parents with children, and old people… We are killing it… Anyways, I digress. The local markets are, in my opinion, one of the best ways to get your hands on good quality produce. Depending on where you go (always check your market guide for your local area) you can get reasonably priced and varied organic fruit, vegetables, meat, cheese and treats. 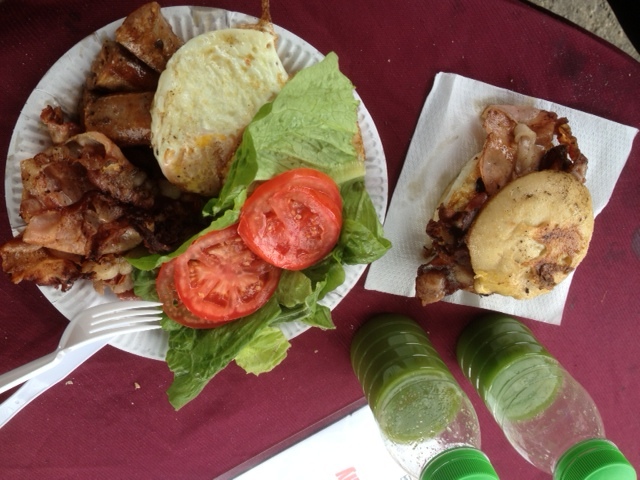 You can also count on there being some amazing food stalls from which to buy your breaky as you walk around the stalls. 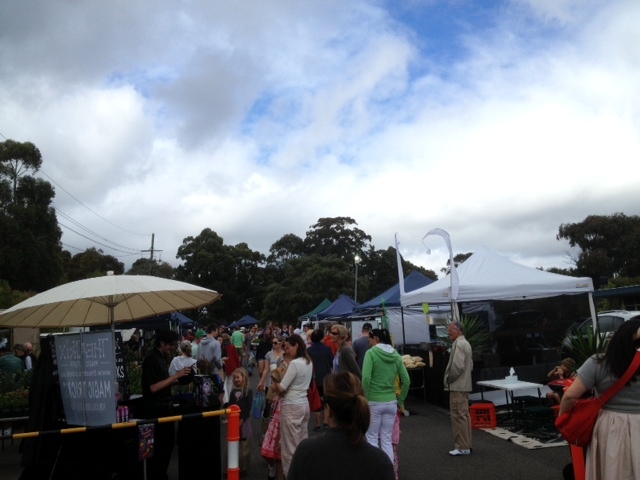 We visited the Frenches Forest Organic Markets, which are one of the most established markets in Sydney’s north. Being organic, we were treated to some delicious breakfast options. I came across a stall offering Organic coconut quinoa served with stewed apples & raw almonds. . Whilst I don’t normally tolerate sweet things in the morning this was too good to pass up. MC and I decided to share this whilst waiting for our organic honey cured bacon and egg rolls/big breaky. 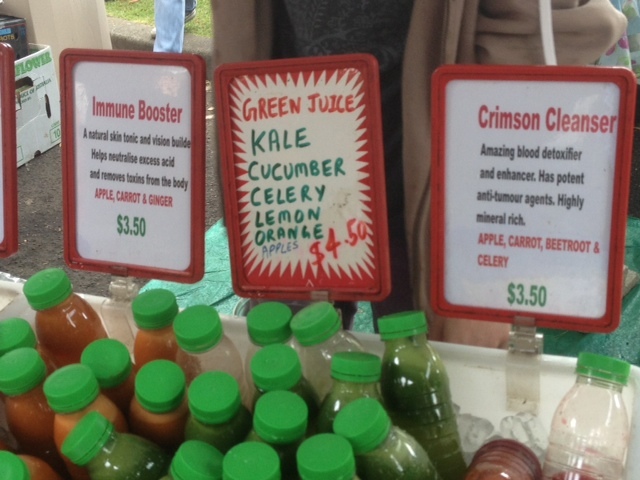 We also washed our meals down with a Kale, cucumber, lemon and carrot juice. Trying to eat with our quinoa bowl in one hand, juice in the other and juggling a runny egg sandwich requires skill and effort – but I guess that’s part of the parcel of eating at the markets. Whilst going to the markets to specifically get breakfast may seem a little off center it is something that I highly recommend you do. There is something extremely relaxing, almost romantic, about pottering, taste testing and purchasing loads of fresh veggies (and of course market flowers). Oh, and don’t forget the coffee; it is at these places that you often find the organic fair-trade coffees which pack a flavor punch without all the added nasties. Ah, yeah- we bought all our shopping for the week, plus a few little extras. 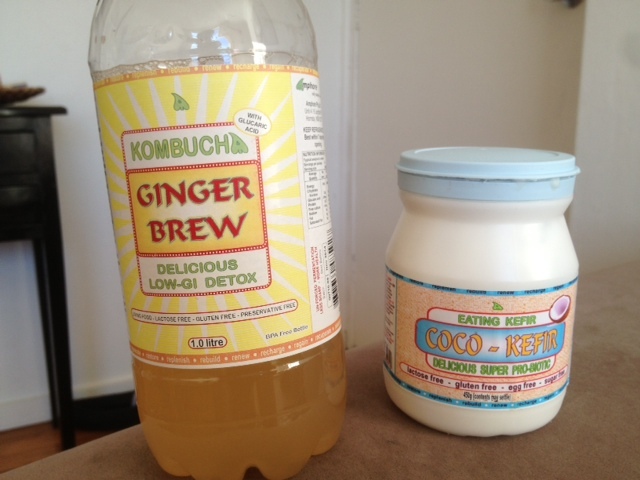 Starting with some coconut kefir and some ‘ginger brew’. These are both fermented products, containing live cultures and other weird sounding things, that are (when all boiled down) great for you. The brew is to be mixed with a little water, and also containing ginger root, is a great digestive aid. Plus on a hot day, mixed with cold water, is incredibly refreshing. As I discovered earlier this week. While the coconut kefir is a ‘delicious super pro-biotic’ that helps gut function, I happened to use it later that day to accompany a brownie I also purchased on our market adventure. Perhaps not the healthiest thing to have on a Sunday morning (that’s my sarcasm font), but relaxing my diet from time to time is all what I’m all about. So, the slight bitterness of the kefir was a perfect accompaniment for the sweetness of the brownie (insert smiley face here). As for the weeks food shopping- this was full of crisp and delicious looking produce – from the grower- which you can’t beat. 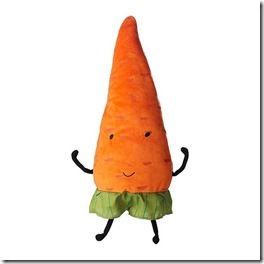 Seriously, I found myself eating a carrot this week saying aloud (common for me) “Goddamn that is an awesome carrot!” I mean, that’s just not something you hear every day, now is it? Fruit and vege aside, I got a little ‘meat drunk’ at The Free Range Butcher, and ended racking up a total of somewhere around $125. This wasn’t because the meat was super expensive, no, it was because in a haze, I had been throwing in packets of nitrate free ham and bacon, duck breasts and steaks before I almost collapsed at the til, faint and confused. Much like this…. It was a weird scene. One in which I should really get a hold of, but what can I say- tasty meat just gets me a bit excited. Those lovely animals have given their lives so I can eat’m, that’s cause enough for celebration, no? How great are the Frenchs Forest market?!? Did you find the lady doing sprouted grain/seeds? 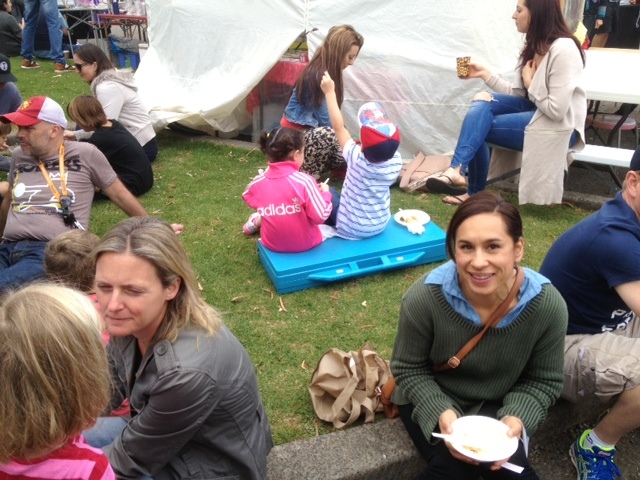 I love the fact you guys when all the way up there when you could have had a lie in & gone to the North Sydney Farmers market (it was on this weekend). Kombucha is AMAZING, good shopping guys. Our local market every Sunday morning with the boys – fresh organic produce, a morning coffee, dried fruit, wraps and biltong for school lunches, organic macadamias, peanut butter, organic hemp seeds for our smoothies and a whole host of other delectables! No worries! Always happy to help out. That’s exactly what they’re good for hey- getting all the things you love, and from the grower/producer!